I stood up, wiping beads of sweat off my forehead after about 20 minutes of battling an invasive plant by trying to locate the nexus of its root structure and uproot its entirety with my soil knife. I’d about given up. Crouching in the soil of the waterway’s bank, I stabbed and sliced its thick underground cords with the tip and side of the tool instead — hoping that if I couldn’t destroy the Medusa of a plant, I could at least fatally, maybe, disrupt it. Meanwhile, the nine high schoolers around me were working expediently, accumulating piles of brush and plants at the outskirts of that riparian zone between riverbank and land that — to an untrained eye like mine — looks like a five-foot-wide no man’s land of wayward greenery. For them, this was a good morning — overcast and in the mid-70s. As part of Forest Park Forever’s Nature Works program, their task was to rid this liminal space of invasive species like the binding plants that wrap around native species and quite literally choke them out, or annoyances like hedge parsley, which would later confetti my jeans and t-shirt in rollie pollie-size burrs after dropping an armful of plant matter in the back of a pickup truck. Nature Works, which is supported with a lead gift from The Boeing Company and a grant from Wells Fargo/National Fish and Wildlife Foundation, has a few parts to its program — and the one I was digging into in July was its internship program, which ran six hours a day, Monday through Friday, June 13 to August 5. 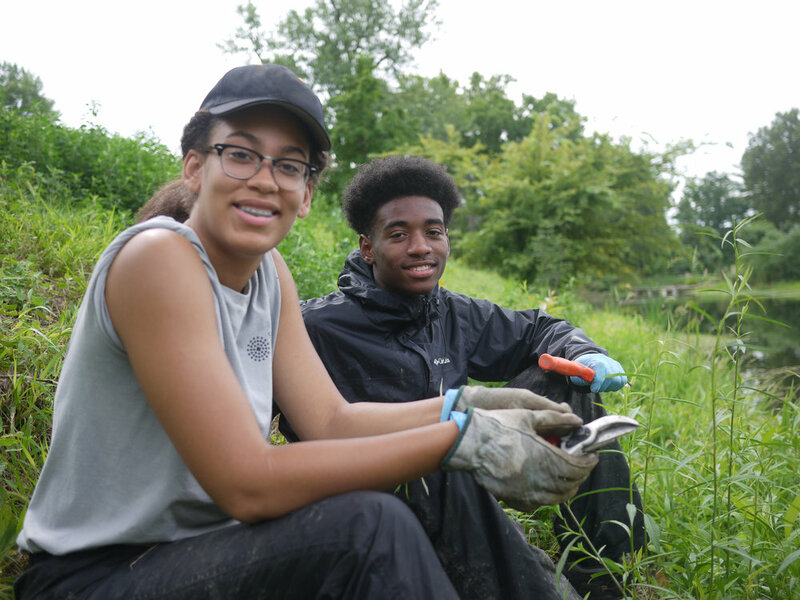 It brings together area high school students to learn about conservation practices and green jobs while maintaining Forest Park’s richly biodiverse landscape and waterways. And yes, it’s paid, with opportunities to learn about different bioscience careers during dedicated education days and to meet students from similar Youth Conservation Corps (YCC) programs around the city. Rosati-Kain student Christine Gates saw a picture a few girls posted last year from the program on Facebook and decided to get involved because she’s deciding between nursing and environmental science for her major. While some days get sweaty and dirty (and, yes, tiring), she says, “It feels like an accomplishment because you can see all the work you’ve done and all the dump truck loads you take out.” She also has a lifeguarding job after her Forest Park shift ends, but Nature Works is the one she gets excited for in the mornings. “They really are walking away with some new skills and real pride in those skills. They practiced determination and persistence and not giving up,” says Jean Turney, education coordinator at Forest Park Forever. Gates agrees that one of the perks of the job is the “cool people” they work with (i.e. each other). They share a group text and are trying to coordinate a time to hang out outside of work (the struggle comes with setting a date that 100% of the group can attend — for many, this is only one job they’re working this summer — and although someone at a remove might suggest simply picking a date that works for the majority, it’s indicative of the group dynamic that it must work for everyone). 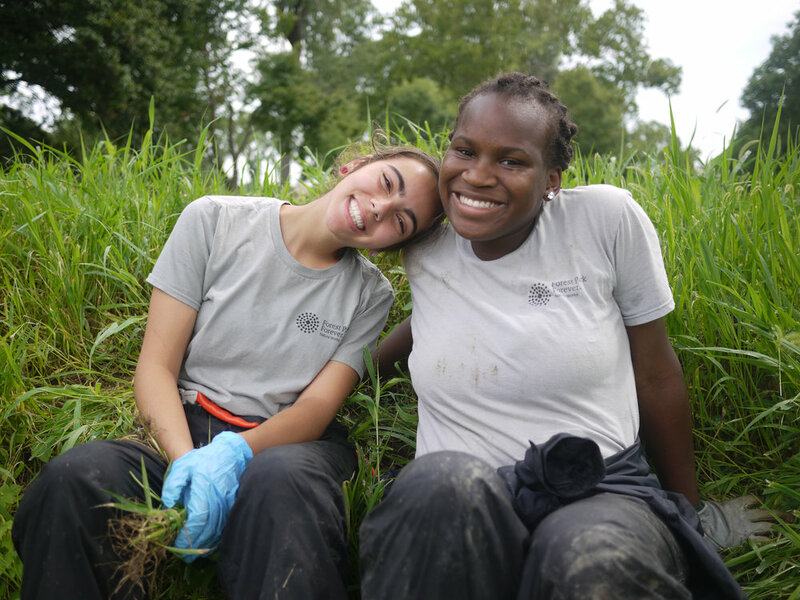 The students involved in the Nature Works program are purposefully diverse, with public school and private school, City and County represented. Only two students this year knew each other before coming to the program (but they were in different grades) — and with as much stratification as St. Louis can have, the speed and intensity with which these students from disparate backgrounds have connected is promising and hopeful and just plain wonderful to witness. The development of the Nature Works program stemmed from questions about how the green workforce, including here in Forest Park, can continue to be diversified. Targeting high school students meant not only recruiting students closer to working age, but it also helped to fill in a gap in their educational outreach programming — they don’t have the luxury to be volunteers but need employment. “We wanted to show them that we valued them and we valued this work — that this is something that should be paid for — and that there are employment opportunities in this field,” says Turney. 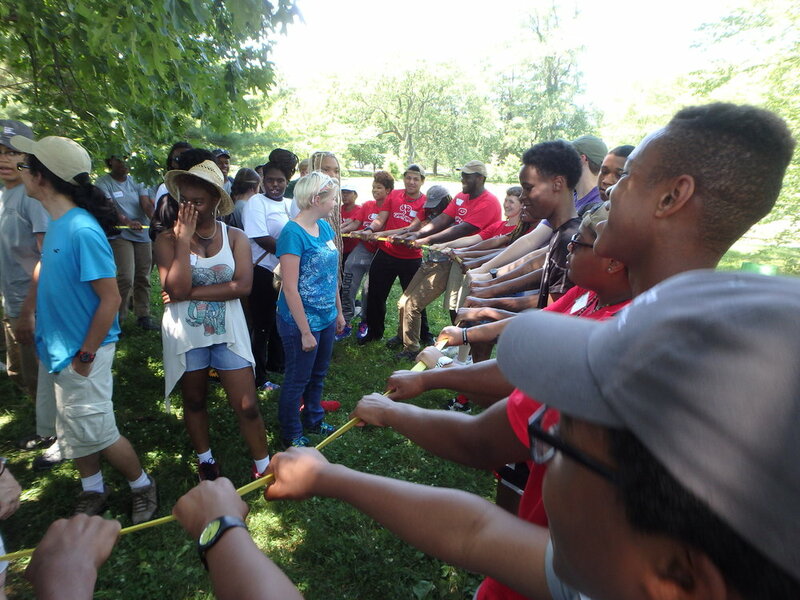 Earlier this year, Nature Works joined forces with the Missouri Botanical Garden, EarthDance Farms, Seeds of Hope and Gateway Greening to host two YCC days. During day one, students learned how to use different tools and picked up work skills for the summer; the second day was more of a reflection day, getting them thinking about possible careers and setting up for life after the program. During the rest of the year, Nature Works has other important components that keep the program alive: There’s classroom outreach that gets kids into the Park to work alongside the pros (bus funding provided!) and field experience that brings case studies from the Park right into the classroom. Now coming up on its fourth year in 2017, Nature Works is growing, too: Last year — the year after the program piloted with two students — there were around 15 applications for the program. This year, there were 52. The students I talked to said they heard about it mostly through word of mouth or, like Gates, saw friends’ pictures from their experiences on Facebook and thought it looked cool. Speaking of, as a Millennial whose generation is often teased for our addiction to our phones, I tend to see the rising generation as even more addicted to their phones and social media (a world which left me at Snapchat). But the phones never came out during my time with these Nature Works interns — they were into their work. And she did. We all did.